Those of you who read this blog regularly have surely noticed that most of my updates as of late have been limited to Grubb & Ellis market trends updates. Aside from being rather busy, I have been remiss in updating BrokeredNYC as I have been devoting an ever increasing percent of my time to data center real estate deals. Recently, I along with the Grubb & Ellis National Data Center Practice Group team have launched a new blog devoted to data center real estate - www.datacenterpractice.com. Below is the latest market report for the NY Metro region authored by yours truly. I hope you enjoy! PowerLoft sold its 233,000-square-foot building in Manassas, Virginia, for approximately $115 million to Corporate Office Properties Trust. The property was 16 percent leased and continues to support the notion that REITS will provide liquidity for data center developers. Given the number of transactions in the market, we should see a strong fourth quarter of leasing activity on a national basis. The entrance of 111 Eighth Ave. onto the investment sales market could create a shift in the Manhattan data center market. A new owner may choose to maximize returns by converting existing office space into new data center space as leases roll. In the meantime, a major REIT is reportedly in negotiations to sublease more than 53,000 rentable square feet in the building. Lehman Brothers’ former data center in 85 Tenth Ave. is a strong indicator of the robust market in Manhattan, as the landlord is in final negotiations with a provider shortly after the property entered the market. New Jersey continues to be a tenant’s market for new wholesale and colocation space as the major developers deliver more space and drive competition. More than 387,000 square feet of raised floor space, 750,000 square feet of total powered shell space and 118 MW of total power is available in the near term. There is uncertainty in the marketplace whether pent up demand from financial institutions will come to fruition in 2011/2012. In both New York and New Jersey, older data centers (circa 80s and 90s), non-wholesale/colocation space is in short supply. 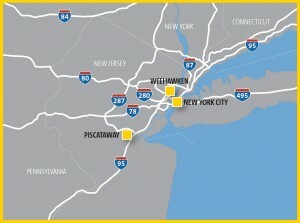 New Jersey has just two existing data centers with usable infrastructure – Bear Stearns/J.P. Morgan’s former facility in Whippany, which has a pending lease for the majority of the space, and Bank of New York’s former facility in Teaneck. New facilities and expansions of existing facilities that are underway in New Jersey include: DuPont Fabros (180,000 square feet in Piscataway, early 2011 target), Cervalis (150,000 square feet in Totowa, late 2010 target), and Sentinel (330,000 square feet in Franklin Township, N.J., early 2011 target). Savvis is at full capacity in its Piscataway and Weehawken facilities, prompting the first phase of expansion of the Weehawken facility by 20,000 square feet of raised floor. The space is targeted toward high frequency trading operations. Equinix has completed Phase 3 of its build-out in New Jersey, bringing the facility to full capacity. The developer has leased a 300,000-square-foot building next door for additional expansion, with the first phase expected to deliver by the end of 2011.